I remember living on MLK Jr. Way in Oakland a couple of blocks from the MacArthur BART station in 1992. We listened to the scanner and always had an eye on the street. The Oakland Police, mostly recruited from the Southern States, could never be heard saying “MLK” or Martin Luther King. My street was “old Grove Street” on the scanner because they just refused to say the words. Berkeley itself is a company town, and that company has it's own cops. As bad and brutal as the city cops were, they were nothing compared to the campus police. Campus police are actually state troopers, again heavily recruited from outside California with the right to patrol and arrest within a mile of any campus property. That is over 90% of the landmass of the City of Berkeley. They have two SWAT teams. One is for the campus/city and the other is for nearby Lawrence Berkeley Labs. Never forget that UC Berkeley has a greater capacity to manufacture nuclear weapons than Pakistan. City Police are often teamed with Campus Police in joint Patrols. Berkeley California is a paisley painted police state. The various smattering of fascists billed their event as a March Against Marxism. Some of those that appeared had a history of harassing the local communist bookstore with over a dozen incidents in the last year alone. Harassment against the various mobilizations of antifascist groups was the game plan. As the included video shows, multiple fascists, singly and in small groups worked their way in with police help, over-watch and protection, carried out their disruptions and waited to for the police to arrest people for defending themselves. The biggest mobilization out of the many, over 500 strong, was kept from marching the few blocks to where the main event was supposed to be until after it was over. After getting their requisite near dozen arrests the police began gassing the crowds and the situation turned into a cat and mouse game throughout downtown with the police hunting anti-fascists while some of the latter were hunting fascists and some the fascists were out looking for hate crimes to commit before running away. The police claim that no rubber or plastic crowd control rounds were used, but at least one was recovered by protestors and is pictured below. The actual arrests made by police were arbitrary and for imaginary crimes like “assist others in committing a crime” without specifying what other people were being assisted and what their crimes were. None of the charges has yet been refereed to the Alameda county or City of Berkeley prosecutors office. Public statements by both show little to no interest in actually prosecuting anyone for anything. What the charges did result in is arrested protestors having their names specially displayed, along with their home addresses on the police website for the fascists to target later. There was also bail money charged that will likely not be returned regardless of prosecution or non-prosecution of these essentially non-crimes. 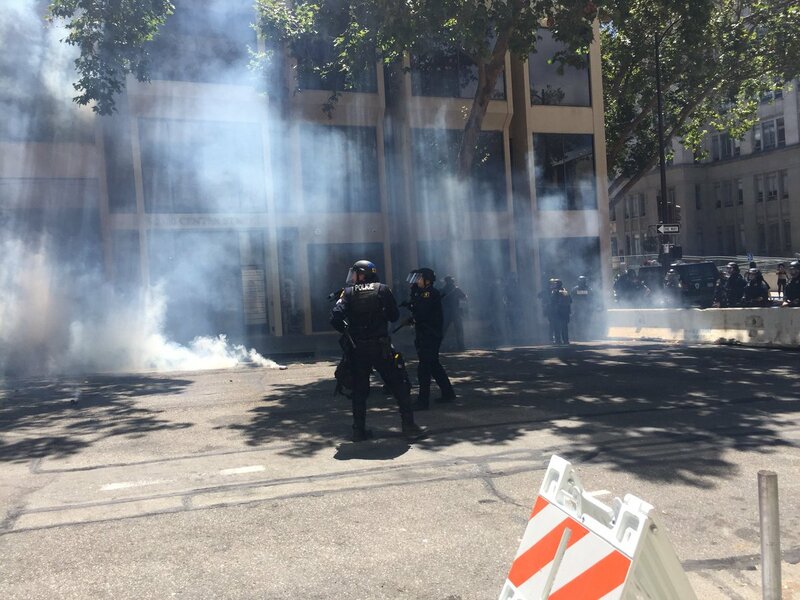 The actions of the Berkeley Police, along with officers from supporting agencies, come against a back drop of direct unprovoked police attacks on anti-fascist protestors in Portland the day before. Additionally next weekend will see major white supremacist mobilizations in both Charlottesville Virginia and Washington DC. The weekend after that will see a major white supremacist mobilization in Austin Texas in the wake of an attack on a protest encampment in San Antonio along with two other attacks on the same organization in the same day. It is clear that fascist groups are growing more emboldened and more mobilized. It is clear they have direct grassroots support from local police departments around the country along with obvious membership overlap.